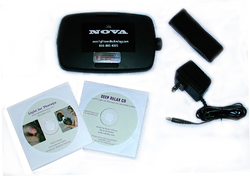 With its sleek, convenient design and substantial treatment area, the NOVA is by far our most popular unit, giving you the ultimate in temporary relief from minor muscle and join pain, arthritis and muscle spasm. Designed exclusively for in-home use. Timer for our patented EPS Treatment, telling you when to move the device onto the next area. 7 user-controlled settings you decide which work best for you. Full Cycle Setting take the guess work out of finding the right frequency for your pain relief. Simple to use. No negative side effects. Plugs into any standard wall outlet U.S. voltage only. FDA and Health Canada cleared. ISO Certified. Call customer service for international standards. Purchase includes Sound Therapy Deep Relaxation CD ($14.95 value) and instructional DVD ($14.95 value) for FREE! Free Strap kit with accessory handle & elastic straps for hands-free treatments ($10.00 value). Also included is our ‘proprietary protocols’ ($19.99 value) to help possibly advance your experience with wellness. Available accessories:Car adapter for added convenience. Call us with any kind of pricing concerns, as we are here to make sure that you get the wellness that you deserve in the most affordable way. We have been in the 'light therapy' business for over 22 years and believe that we have the knowledge in the light therapy field. You all have a choice to shop anywhere, but for the ave. price of a cable bill we believe that we can help with your stress and with your pain relief. We are also concerned with everyone's budget, and believe that our products are priced accordingly. Our Nova Light Therapy System is a wonderful alternative wellness system for minor pain relief, stress relief, and possibly skin care issues for home use that is easy to use, safe, affordable, and effective.